We’re all about our folding method these days – what with Marie Kondo top of mind. These flavorful little pouches are folded up with rotisserie chicken, fresh veggies, and healthy fats — a blend of ingredients guaranteed to keep your body fueled and blood sugar balanced. Integrative nutritionist, Jennie Miremadi is our one of our go-to resources for quick and easy recipes like this one. Her versions of convenience foods are healthy cheats we can totally get behind: pre-made rotisserie chicken and a bottle of dressing. If you need a homemade ranch, try this one. Add chicken, ranch dressing, lemon juice and parsley to a bowl and mix until combined. Adjust salt and pepper to taste. Place collard green leaf on a cutting board and shave stalk to approximately the same thickness of the leaf. Fill the center of the collard leaf lengthwise with chicken salad mixture. Top chicken salad mixture with tomatoes, avocado and red onion. Either fold collard green leaf inward over the chicken salad, roll into a wrap and cut wrap in half or eat open-faced. Serve with your favorite side salad and enjoy! 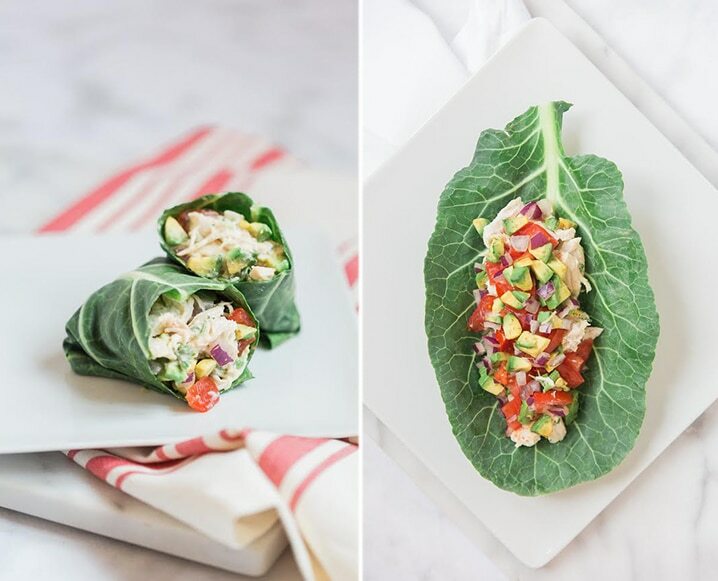 Share the post "Clean Chicken Salad Wrapped In Collard Green Wraps"
Umm leafy greens are meant to be cooked to remove the bad stuff. These should be steamed! They look great though.